Western journalists with bellies full of beer no longer crowd, shouting and giggling, into cyclos and hurry to the House of Five Hundred Girls. Grenades are not routinely flung into cafes. There are no fat Burgundians sautéing capons in butter. No jaded English reporters playing quatre cent vingt-et-un with cerebral French policemen. The casinos, the Corsicans, the cargo boats from France are all long gone. The sickly sweet smell of opium does not hang in the air. Girls in silk trousers no longer cycle to milk bars. The red flag flies, now, in place of the Tricolore. Yet there is a surprising amount left of the Saigon which Graham Greene knew when he reported from there in the dwindling days of French Indochina and distilled it into his classic novella, The Quiet American. 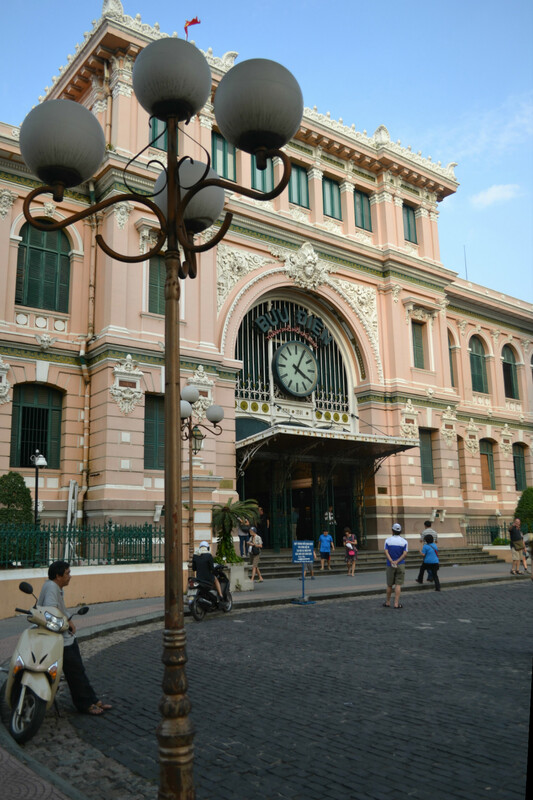 The official name has been Ho Chi Minh City since 1975 but locals still call it Sài Gòn. Greene’s narrator, Thomas Fowler, lived with his Vietnamese girlfriend, Phuong, in an apartment near the river on what was then rue Catinat. When the French left and Saigon became the capital of South Vietnam and rue Catinat became Đường Tự Do (Freedom Street), it filled up with brothels and drunken GI’s and fell into sleazy decline. Since reunification it has been Đường Đồng Khởi, or Total Revolution Street; but despite the name, it has gone back upmarket and has much the same character now as it had when Greene stayed there. Fowler’s apartment is based on one in which friends of Greene’s lived in the old Saigon Palace Hotel, down-at-heel in the early Fifties but restored now to its belle époque splendour and once again a hotel, the 4-star Grand. If you take the walk which Greene often took, up and down Đồng Khởi, you will still see much of what he saw, amongst the high-rise modern blocks. Start down by the river, where Fowler watched the stevedores unloading American planes by arc light and the sailors on the pavement drinking beer, pass the Majestic Hotel, a block from the Grand. Call in for cocktails if you like, as Greene and his character did; or go back in the early evening to watch the sun set from the rooftop bar and feel the breeze from the Sài Gòn River. Carry on up the street, past the flamboyant fin de siècle opera, which the communists renamed Municipal Theatre to make it sound more democratic, to the Continental Hotel where Greene sometimes stayed and where Fowler met Alden Pyle, the Quiet American of the title. Pyle lived in rue Duranton (now Bùi Thị Xuân) at the other side of what is now the Culture Park with its propaganda posters and hilariously slanted accounts of the war, and worked at the American Legation at 39 Hàm Nghi, a surprisingly modest corner block, which is still there now. He was officially part of an economic aid mission, but his real job was to supply insurgents with plastic explosives to stage atrocities which could be blamed on the communists. 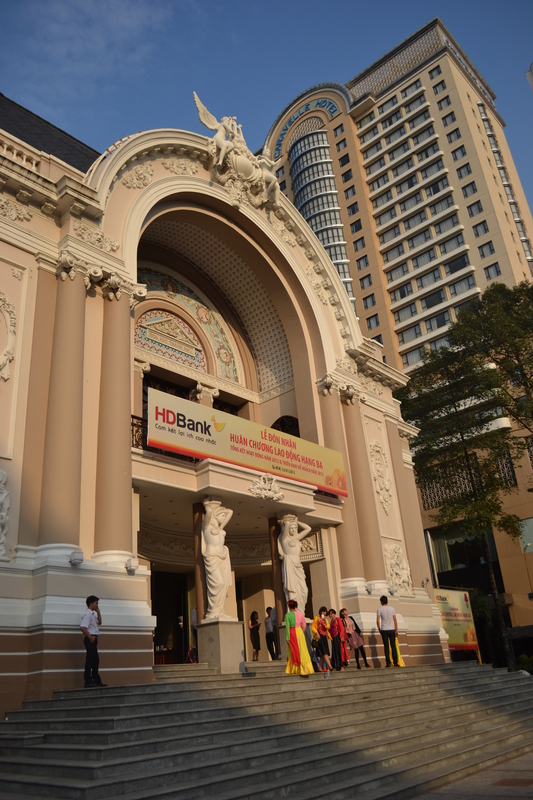 Further up Đồng Khởi, beyond the Continental, is “the hideous pink cathedral” of Notre Dame and the neoclassical Central Post Office, with steelwork designed by Gustave Eiffel and maps on the walls of Saigon et ses Environs 1822 and Lignes Telagraphiques du Viet Nam et des Cambodge 1930. The mosaic of Ho Chi Minh on the far wall would be new to Greene, but he would not be surprised to see it, nor disapprove. But the old Đa Kao bridge, where Pyle was murdered, was replaced in the 1980’s. The colonial block across from the Continental which appears in the 2002 movie in which Michael Caine played Fowler had gone by 2009. The Art Deco model for the rubber planter’s “so-called modern building (Paris Exhibition 1934? )” which Fowler thought about renting disappeared just last year. 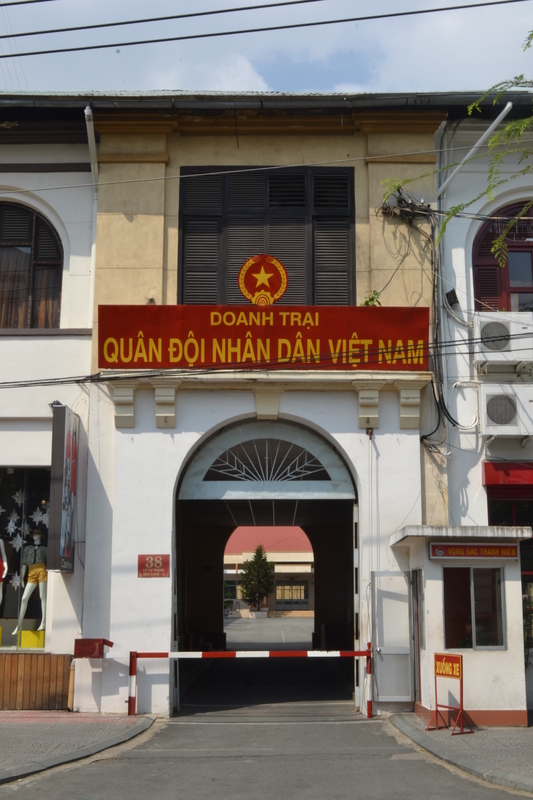 The notorious Vietnamese Sûreté, whose “dreary wall….seemed to smell of urine and injustice” survives for now as offices of the Department of Culture, Sport and Tourism, with the old cells in the basement, but it is about to be pulled down to make room for a luxury hotel. 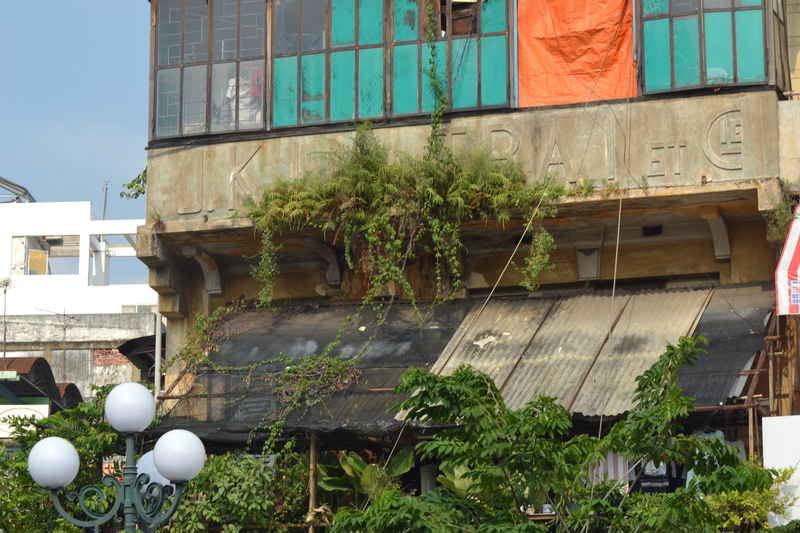 Colonial buildings all over town have been left to rot since independence, with old French shop signs still faintly visible, and missing render, and tin sheets nailed onto roofs where the tiles have dropped off, and shutters hanging by one hinge. They are gradually vanishing as Vietnam develops. There are still the cyclos – Greene called them trishaws – which pedal slowly through the pages of The Quiet American, but they might not be there for long, either, because the authorities apparently want shut of them. “There seemed at first so little that had changed”.